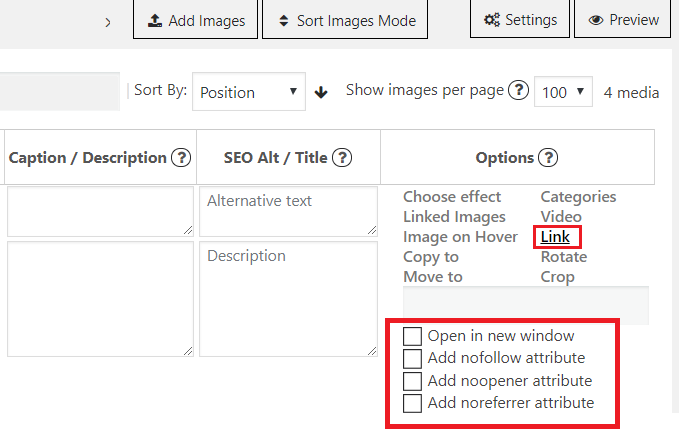 Photo Gallery plugin allows to automatically add noopener, nofollow, noreferrer attributes to the links for a gallery, and make a step forward into the security of your website visitors. If you enable these options, attributes will be added to all the internal and external images links when you want to open them in a new tab. When a user visits your website, the main information that is being recorded is where the user has come from. You get this information in the form of the URL of the page on which the person was on when cames to visit your page. If you get that information you can go to the referrer page and check the link that the person has clicked to get into your site. You will get this information from tools like Google Analytics. Clicking on a link, your browser sends a request to the website server of the link asking for the page. Also, it sends extra information – type of browser, the referrer page, the location, the device, etc. This enables the website server to save the information of how the people arrived on the webpage. If you add the rel=noreferrer attribute to a link, no referrer information will be provided. If no information is in the header, then it will not be tracked by analytics tools. Why do we need “noopener”? When nofollow attribute is added, it asks the search engines not to follow the specific link. It does not pass authority to the website. The main advantage of rel=nofollow is to control the spam attack.